I was born in November 1998 and have been racing my bike competitively for 11 years. I got the bug for cycling from my dad who has been racing since he was a junior. I remember my first real racing bike was a rare little Junior Bianchi which my dad managed to get from Italy. The bike was steel and had the shifters on the downtube which looked proper old school, It also had smaller than normal wheels and in fact had tubs which were glued onto the rim so as you can imagine as a youth D turning up to races with that bike I got some jealous looks. To this day I still regret selling it on as it was such a stunning frame and one of a kind. As I grew older through the beginning of my teenage years I realised I had a true passion for this sport and everything that came with it. I started competing in races throughout Scotland as a youth, all of them being criteriums (a tight circuit race usually lasting around 40 mins through narrow streets and tight corners). They were ideal for us youths at the time because we were able to learn a lot of skills which you would need if you were wanting to be a good cyclist such as bunch riding, tactics and being able to keep on top of nutrition etc. But the main thing was I loved every minute of it, I made new friends, and I enjoyed the travelling aspect of it all. Onto my junior years now which meant I was able to race on the open roads with older riders, sometimes even elite, which was for me, a big step but I was willing to take it on. I managed to gain my 2nd Cat license within the first 6 months by getting good results and being consistent. My first year as a junior was really just about gaining as much experience as I could before moving up another level in 2016, My 2nd year as a junior was a lot more serious as the travelling and level of races kicked up a notch. I was with Edinburgh Racing Team at the time who did a grand job for me, supporting me financially and always there for when I needed help. I had the great opportunity to travel around the UK and race the toughest Junior races i.e. the national series. The top juniors from around the UK would come to these races and fight for glory. I soon realised after struggling in every round that I needed to really start raising my game . A lot of the boys I was racing at the time were a lot bigger than me and more developed so I was already at a disadvantage but nevertheless, I still tried my best every time. So after 2 years as a junior and at the same time, coming towards the end of my school career, I decided to go for it and put 100% of my time and effort in this with the goal of becoming a professional cyclist. But I knew for sure this wasn’t going to be easy. 2017 came around and my first year as an U23 cyclist. This was really the beginning of being 100% committed to the sport which meant a lot of sacrifices were to be made but I was willing to do it. The start of that year me and some cycling friends headed out to Spain for our first ever proper training camp which took place in the Costa Blanca region of Spain not far from Benidorm in a place called Calpe. Calpe is referred to as ‘a cyclists paradise’ by most professional and amateur riders from around the world because of its stunning scenery, smooth roads and the warm weather. This was my first taste of being abroad alone for quite a long period of time so I was apprehensive as to how I would cope. Being at this camp, riding and training on my bike every day and being responsible for my own well-being made me appreciate the sport so much more that my passion just grew and grew even when I thought it couldn’t. At the end of the two weeks my two training partners left for home but I stayed on for one more week to join ‘Zappi Racing Team’ for a trial week. I had followed this team for some time on social media and it really appealed to me. They are a British established team but they have a European racing calendar and are based in Italy and for those of you who don’t know, my family are crazy for Italy, my dad even has a bold Italian flag tattooed onto his calve. If that doesn’t say crazy I don’t know what is. 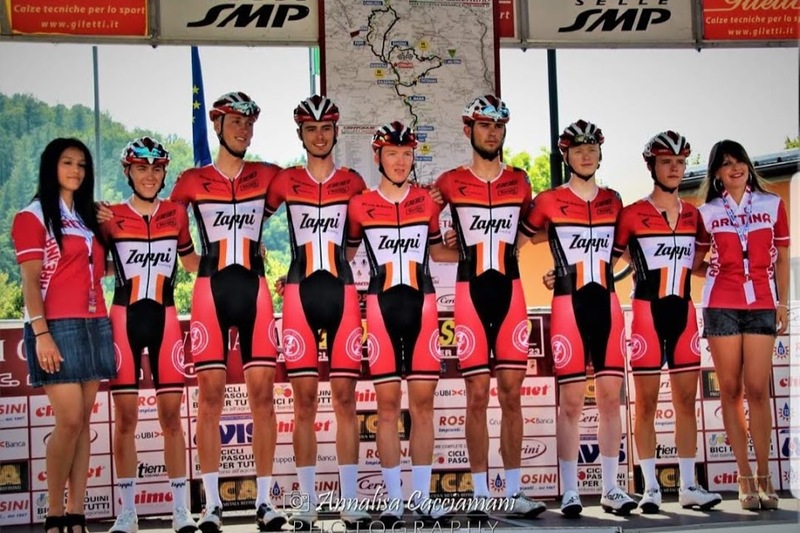 Anyway, the team is run by Flavio Zappi, an ex Italian pro who raced in races such as the ‘Giro d’Italia’ and ‘Paris – Roubaix’. Flavio makes sure he gives the opportunity for riders who want to prove themselves and he has done this very well. He takes an old school approach which works for some, nowadays people tend to get too caught up on numbers and become obsessed with all this data, yes it can be incredibly beneficial but for me personally, it’s something I’ve never really used and that’s why the old school approach works for me. My trial week with Zappi’s went so well I was asked back to compete in Italy. The first race being ‘GP Liberazione’ and the second being ‘Trofeo Corri Per la Mamma’. Both of these races would be my first taste at an international level against some of the best U23 riders in the world so although I was very excited I was also apprehensive and nervous. Throughout that year I was back and forth from Italy racing with the team, that was until August, when Flavio messaged me asking if I would like to go out for the last 2 months of the season. That was a massive oppurtunity and the following week I made the journey over to Bergamo. Those 2 months were just one big learning curve and it resulted in me signing for Zappi’s for the 2018 season which I was over the moon with.